​Our herd tested negative for CAE, CL and Johne's Disease in 2016 and 2017! ​Buckwheat was our first ND doe. She is very friendly and the herd matriarch. Her blood lines are Desert Nanny and DF Farms. She is ADGA registered. Buckwheat has the nicest udder of the doe herd. Her larger teat size makes it easy to milk her. This is her second freshener udder. ​Carson is a shy doe, but is becoming friendlier with each breeding. She is a very calm and competent mother, and is good on the milk stand. She is ADGA and AGS registered. ​Ani is a sweet little doe that we brought in from Aztec, New Mexico. She is distantly related to our polled buck, Budger. She is AGS registered. ​Cinnamon is a beautiful and friendly chamoisee doe. She is registered with the ADGA and AGS. Cricket was the first doe born on our property. She is ADGA and AGS registered. She has a pretty impressive udder, for a first freshener. She is easy to milk - her teat size is respectable, but they point outward, instead of forward. Hopefully, this corrects with future freshenings. 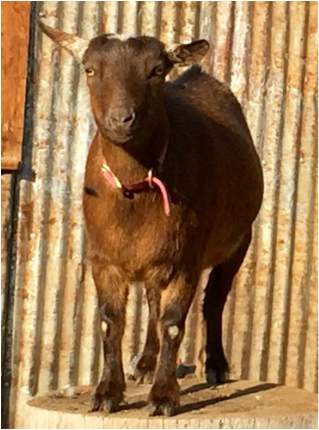 Katie was bred in Kanab, UT, at a semi-commercial goat dairy. She comes from a line of beautifully distinct dairy goats - they have a long level top line and a long elegant neck. She has strong dairy blood lines. Katie is ADGA and AGS registered. ​Glory is from Tucson and brings excellent show and milk genes to our herd. She has a beautiful, long neck, and long level top line. She is ADGA and AGS registered. Lottie was born in 2018, and has excellent milk and show genes. She is ADGA and AGS registered. Ariosa was born in 2018 on our homestead, and was one of a set of quadruplets! She is super friendly and represents the fourth generation of our herd, Coconino Nigerians. She is ADGA and AGS registered.